I am one of those people that, if given the chance, will eat an entire chocolate cake. Don’t judge! It’s just some natural instinct I have…and it especially comes into play when I’m dealing with my grandmom’s chocolate cake recipe. Okay, seriously though. Now that you’ve seen the above picture, I don’t think you can judge my obsession. It’s one of the best desserts I’ve ever eaten. I always get a crazy craving for this cake. True love. That’s how one could describe the relationship between me and chocolate cake. One thing better than eating a piece (or multiple pieces) of this cake with a big glass of milk while watching TV alone in your pyjamas, is sharing it with other people! Now that I’m at university and staying in residence, I got that chance! My new friends Carissa and Allison helped me make the cake, and it was shared with basically anyone who walked by the kitchen! 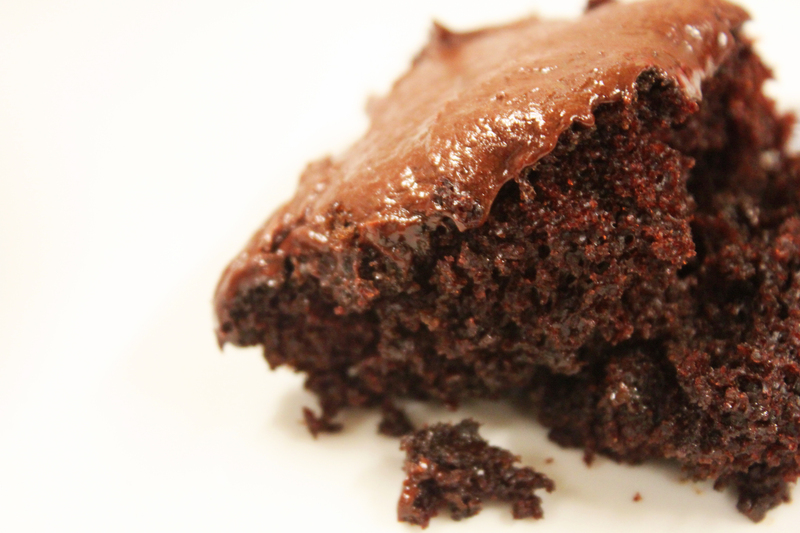 If you like gooey, moist cakes, THIS recipe is for you! Heat oven to 350°F. Grease and flour two 9-inch round (or square) baking pans. Bake 30 to 35 minutes or until wooden pick inserted in center comes out clean. Cool 10 minutes; remove from pans to wire racks. Cool completely (this is VERY important!). Then frost with the frosting recipe below. I hope you enjoy this recipe as much as I do! Lots of love! Ohhhhh…there is nothing like Grandmom’s chocolate cake. I should know!